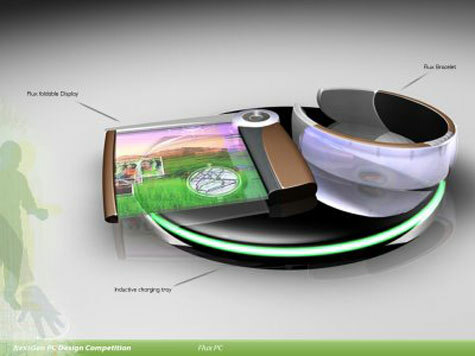 The Flux PC concept is an ultra-portable computer that can be worn on your wrist and consists of three parts: the bracelet, a display that can be folded and the inductive charging tray. It is designed based on the following principles: flexibility, mobility, friendly user interface and fashion. The bracelet, stores the wearer’s personal information and connects wirelessly with the foldable display that provides multimedia features accessed via a touch-sensitive interface. The bracelet stores the user’s personal information while the display incorporates a larger viewing area and multimedia devices. That’s the Momenta, one of the finalists in Microsoft’s Next-Gen PC Design Competition. 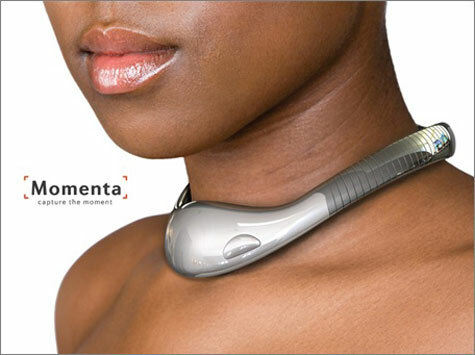 Momenta, the neck worn PC also captures the best and most exciting moments of your life. Ever thought, “Man I wish I had that on tape!” When everybody is laughing themselves to tears, Momenta has already captured the previous 5 minutes from its rolling buffer and continues to record until you tell it to stop. Triggered by increased heart rate, it captures those hilarious or exciting moments that are usually lost forever. Whether it’s an exciting sports experience, a funny social scene, the scene of an accident, etc. you can capture it and share it.